Some of us originally learned to ride by watching Westerns. Cowboys held both reins in one hand and jerked the horse sharply sideways to turn him, and the bit jerking the mouth open added drama. They were in an angry rush, leaning forward, and kicking really hard with spurs sharp enough to puncture a kidney. Then away! Bouncing in the saddle with that weird flying chicken-arm flap. Okay, I exaggerate; the Cartwrights were passable riders. And the Lone Ranger. Some of us started riding with a body position most closely compared to those plastic toy cowboys and Indians. Remember? The cowboys and Indians all stood with their plastic arms up over their heads and their legs all in an identical bowlegged position so that they could be put in the saddles of plastic galloping horses. Riders in the same lifeless plastic position on lifeless runaway horses. These are extreme examples but the challenge of riding frequently boils down to finding the balance between too much energy or too little–between the horse and the rider. In that first scenario, the galloping horse probably feels like he has a mountain lion tied to his back and in the second plastic scenario, the horse is carrying dead weight–a huge cinder-block–on his spine. Both situations are stressful for a horse but in the process of the horse trying to tell his rider that he’s uncomfortable, a rider might come to the conclusion that the horse has a behavioral problem. Oops. Right about now, a more mature rider might think twice, remembering that as a kid it was all different, while making a resentful judgment each stride. As that anxiety becomes braided with the energy, the horse reads every bit of tension, every thought of blame and fear. It’s also known as digging the hole deeper. How can kids, who know less about riding, get a better ride? They are too young to have hindsight! They don’t over-think it; they just go along with the horse. And it’s something an adult can’t fake, so give up punishing yourself and start again. The more rhythmically the horse moves, the more he relaxes, and to the degree that the rider participates in that, we become one with our horse. The only way to influence a horse’s brain is through his body, and he wants that conversation quiet and reciprocal. No flapping arms and slapping leather, but also no tense, unnatural stillness. So as your horse is walking; let there be no sharp or hard places between you. Control yourself. No knees gripping, no bouncing backside, and definitely no jagged emotions. Find the sweet spot moving along peacefully with your horse, not pumping hard or dead-stiff and tense. 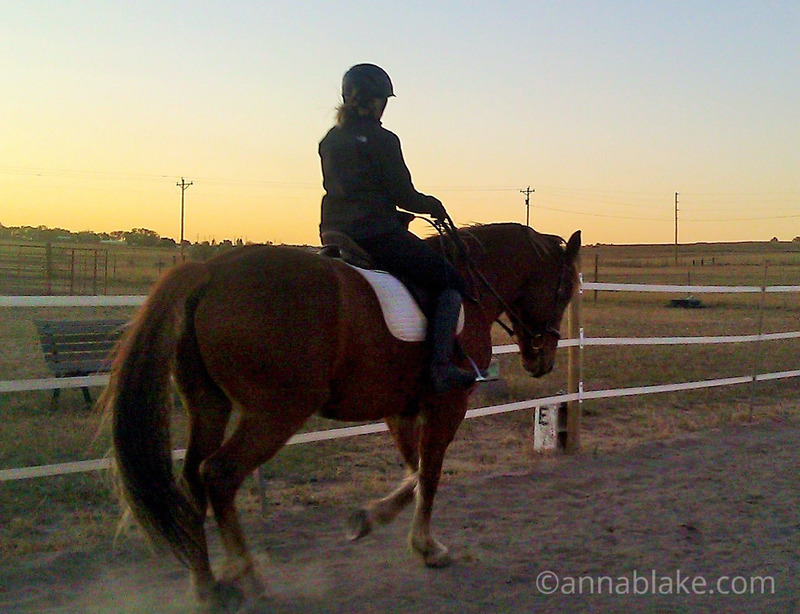 Allow your sit bones release to the movement as your horse strides up underneath you. Let your fussy thoughts go, as your legs follow the gentle swing of his barrel. Be halfway between a noodle and a brick. Think slow dance. Now it’s time to alter the speed of the gait, but maybe when asking to horse to slow down, the message he hears is a tense, “Don’t go so fast!” Or maybe when asked to speed up, the message he hears is, “Get ready to be scared.” Know this: A horse hears what the rider honestly felt, not what the rider thought she said. If your horse feels nervous, it’s a good day. You get to practice breathing. Think of your breath as a way to clean up any unhelpful emotion that might be accelerating the two of you to a place neither of you want to go. Slow your breath and lower your energy by releasing the negative self-chatter. Inhale. Find the resistance in your own body; that’s where the message is being sent from. On the next exhale, neutralize the emotion so your body can soften. Be aware when your ribs relax and then feel your horse take that cue. Let your breath show him what you want him to do. If your horse has low energy, can it be a reaction to you, as well. If you are too still, too stiff in the saddle, it will alter his natural rhythm and unbalance his gait. After all, isn’t part of the cue for a halt to stop moving your seat along with him? Instead of asking him to go forward by bearing down and getting strong, inhale lightly and energetically, then lighten your seat and attitude. Let your core percolate, and your sit-bones float. Instead of a harsh emotion like fear or defiance, or a even a positive intention that sets an expectation, just let your elbows and seat get free. Allow him to move on. I’m reminded of the Buddhist concept of detachment or emptiness. Horses do this better than we do. It isn’t like us to want to go along. We’re control freaks and proud of it. It keeps us busy! We rush to judgment, good or bad, and land in an adversarial position most of the time. Horses are only too happy to help us with this training issue. Maybe the best definition of freedom is energy without emotion–lightness without shadow-blame or dark recrimination. Maybe that fresh honesty is the best cue we could take from horses. I laughed aloud in a giddy “aha!” way when I read the line: “Know this: A horse hears what the rider honestly felt, not what the rider thought she said.” Yep, I’m taking this to the barn today. Your book, Relaxed and Forward, has already been so helpful. My horse and I have a great relationship but lately I feel like I just pressed the turbocharge button on a rocket ship (in a good way!). *feeling blessed & grateful* Thank you, Anna! You’re welcome. Have a light and fun ride. Lovely! This is a beautiful, print it out, leave it on your saddle (or better, grooming box) piece. Note to self: review daily. I can know this in my head, but when I feel it in action, it clicks with a strong “YES”. It’s such a challenge to get to this place when I believe I’m already there. Luckily, i have horses willing to correct my misperception! Hehe, I notice that cheerful willingness to correct here as well! Great comment! Someone reviewing Relaxed & Forward said it was repetitive. Yes, it is. On the topic of breathing, I feel good about harping on. There’s no more effective cue! And being a work in progress means you’re listening. Good for you. oh my, so very well said! Thanks, Rosie. And even I know it’s easier said than done! So well said, Anna. As I reread this, I realized just how much of what you said can apply to human relationships as well. I am thoroughly enjoying “Relaxed & Forward” – two or three blogs at a time! Agreed, Jean. Especially during election years! And glad you are enjoying the book… just a piece at a time. This works in hand also. Thank you Anna!! Maybe even better! Just in from a video shoot with ground work at liberty. Thanks for commenting. Another thought provoking post, although as a primarily western rider, I had to wince at your description of the cowboys riding in the westerns. Lightness is just as important in western as it is in English riding. I know you were doing it in part as an analogy, but- ouch. I did find your take on breathing interesting. I’ve found when ponying horses, if I take a deep breath, often the horse will mimic me by taking a deep breath him-or-herself, and their adrenaline will come down. This works even though I am not nervous myself. One of the things I like about my job is that it is very similar to meditation for me. I’m totally in the moment when I’m working. Any worries, aggravation, and even physical pain, fade away during the time I’m actually ponying the horse. I wouldn’t trade my job for anything. I’m very lucky to be doing something for a living that I love so much. Not bad for movie stars. And you do have a great job. Thanks for you comment and sorry to pain you. I’m telling my age, but I watched both shows when they were on the first time. I was just a child though, LOL. Thanks for the memories, and for your enjoyable, thought-provoking blogs. Yeah. Me, too. I watched them a decade before my birth while I was an egg. 🙂 Thanks Sandy. I love this. It is amazing how much just breathing can help, and how much emotions can hurt in the saddle! Wow. So much to take away, and yes that made me laugh so much, regarding the message that the horse hears…….thank you Anna! In the world of confusing things, horses stand apart. Kinda like that. Thanks for commenting.